She was born 154 years ago yesterday. The year was 1859, the place the little village of Bad Köstritz in what is now the German State of Thüringen. Her father was Johann Christoph Gustav Graumüller, her mother Auguste Wilhelmina (Zimmermann) Graumüller. Like so many of my German relatives, I know so very little about Henrietta. And there is something in particular I would so much like to know. That’s all there is. There are no other references. And, as a family, we have nothing more. No family stories. No photographs with her name carefully written on them for us to see. No school reports carefully preserved. No letters. No notes. I don’t know if Henrietta ever married. I don’t know when and where she died. It’s only been recently that I’ve been able to get the marriage and death information for her sister, my great grandmother, Emma Louise (Graumüller) Geissler. Records from that part of Germany haven’t been microfilmed, and my resources have been put primarily into researching my direct line. So there are really only two more things I know for sure about Henrietta. A new life free from the stain of one word carefully recorded by the pastor of that church in Bad Köstritz. The word written in the column where, for other children, the name of the father was written. And it’s also pretty clear that Elisabeth wasn’t exactly coming clean about her parentage in her new land. When she registered for Social Security in 1940, she listed her grandparents as her parents8 — probably to avoid having to admit that she didn’t know her father’s name. So… I can’t help but wonder… here all these years later… what Henrietta was thinking in those days before her child was born. Was she excited… or fearful? Was she thinking of the child’s bright future… or her dim prospects? And my mind wanders to that day some 27 years later when Elisabeth prepared to leave Germany, saying goodbye to all she knew for what could well have been the last time. Was Henrietta still alive? What was she thinking then? Did she regret any of the choices she’d made? Was she happy for her child… or grieving over losing her… or both? 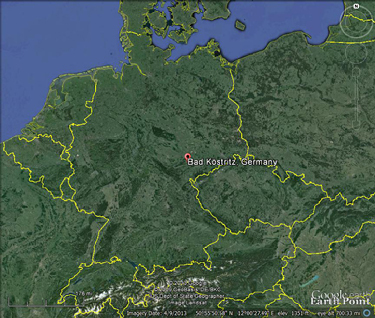 Image: Bad Köstritz, Germany, via Google Earth. As always, I love how the compassion that you have for your ancestors and their stories shines through in your writing. Even with the unanswered questions, there is so much insight that you were able to glean from these few records. Thanks for sharing! Thanks so much for the kind words! It’s really these stories that keep me in genealogy! Guten Morgen ! Ich bin so fro , von Ihnen zu hören. Ich senden Ihnen und hoffe, dass wir Informationen über die Vorfahren teilen wir tauschen!